We have used the Freepascal meets SDL site, our first recommended resource, to provide these sections to help you to start using SDL. The following applies to Microsoft Windows operating systems. We begin by giving instructions to write and run a limited range of programs using some of the parts of SDL and then provide guidance on extending the functionality. You need to download SDL.dll, which is available currently in a zip file. If you have the necessary access rights, put SDL.dll in your system folder (where there may be around 5000 .dll files already!). The pathname of the system folder is likely to be c:\windows\system32. You can alternatively put SDL.dll in the folder of each program that uses it, if, for example, you are working on a networked computer and do not have the right to add files to the system folder. Add the path of sdl.pas and jedi-sdl.inc to Other Unit Files as shown below. Click on the ellipsis alongside the Library path. We obtained the following using Delphi 7. You can use program PutPixelDemo to test this basic set-up in both Lazarus and Delphi. There are many other files you can use to extend the functionality. These are tabulated on the SDL Meets Pascal site. You can use other dynamic linked libraries such as SDL_mixer.dll, smpeg.dll, and SDL_image.dll in the same way that you have used SDL.dll. You can use other header files such as sdl_mixer.pas, smpeg.pas and sdl_image.pas in the way that you used sdl.pas. To test your set-up for these additional units, you could try to compile and run program JEDISDLAliens in the folder Demos\2D\Aliens of your header file download. This should compile in Delphi after you have performed the automatic set-up and added the above dynamic link libraries either to the program folder or to your system folder. 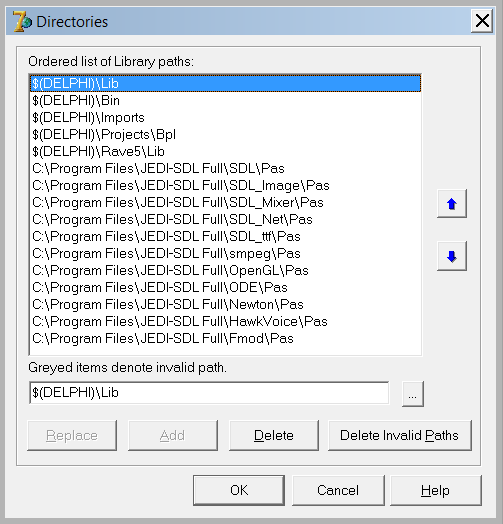 In addition, you need a copy of jedi-sdl.inc in each of the three additional Pas folders that you have added to the unit file path list.